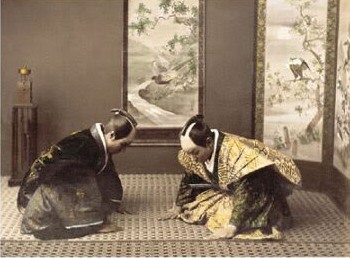 When entering or leaving the dojo, it is proper to bow in the direction of O’Sensei’s picture, the kamiza, or the front of the dojo. You should also bow when entering or leaving the mat. If sitting in seiza becomes too much for you, sit cross-legged (agura). Its much more polite to sit cross-legged than to be squirming around all class. Do not bring food, gum, or beverages with you on the mat.